Few sports have a more evocative name than “Murderball”, as Wheelchair Rugby was originally called. The sport was developed in Canada in 1977, as an alternative to wheelchair basketball for people with quadriplegia, who tended to be non-competitive in that sport. Players must have a disability which affects all four limbs. A point is scored when a player carries the ball across a goal line at the end of the court, and chair to chair contact is used to clear a path or to stop players from scoring. Teammates of the ball carrier create screens or attempt to hold players using their chairs so that they can’t reach the ball carrier. It is akin to a mix between American football and wheelchair basketball. Players are classified using a point system according to their impairment, and low point players generally have blocking roles, while high point players make and receive the longer passes and carry the ball or chase the ball carrier. 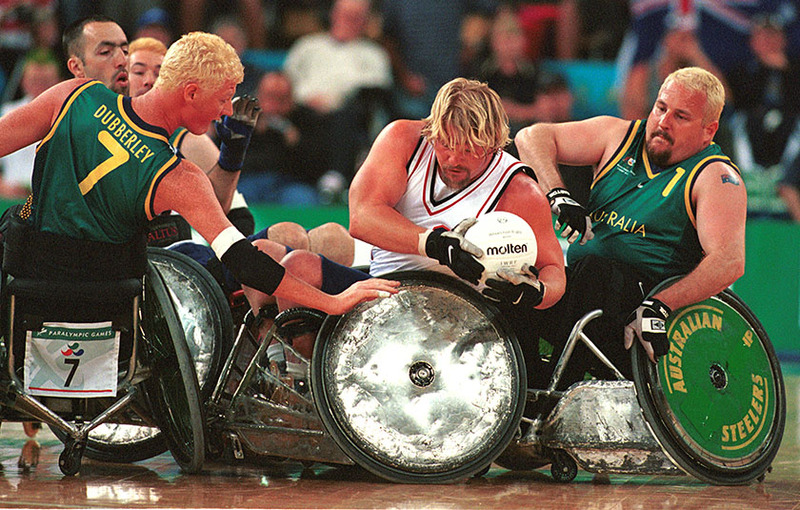 Wheelchair rugby came to wider public notice in 2005 with the release of the documentary film ‘Murderball’ and the 2009 release in Australia of the book, also of the same name, by journalist Will Swanton. Both promoted an image of wheelchair rugby players as the hard men of Paralympic sport, on and off the court. However, the sport’s competitiveness now calls for the same discipline and dedication as any elite sport. Wheelchair rugby is a mixed sport. However, fewer women than men meet the eligibility requirements and do not often make it to international level. At the 2008 Paralympics, Canada had a woman on its bronze medal team. The sport was traditionally dominated by the USA, which boasts the strongest domestic competition, and one of the largest pools of potential players. Since 2010 Australia and Canada have challenged that dominance. The Australian team, known as the Steelers, has won medals at four of the past five Paralympic Games and four of the past five world championships. It 2018 they were the defending Paralympic champions.